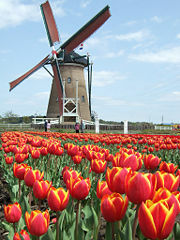 A Dutch tower windmill, sporting sails, surrounded by tulips. A windmill is a machine with rotating blades that is designed to convert the energy of the wind into more useful forms. The term also refers to the entire structure that carries (and includes) the machine. In much of Europe, windmills have served to grind grain and pump water. Most modern windmills, more appropriately called wind turbines, are used to generate electric power. A windwheel operating an organ is described as early as the first century C.E. 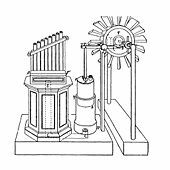 by Hero of Alexandria, marking probably the first instance of a wind powering machine in history. Vertical axle windmills were first used in eastern Persia (Sistan) by the ninth century C.E., as described by Muslim geographers. Horizontal axle windmills of the type generally used today were invented in Northwestern Europe in the 1180s. 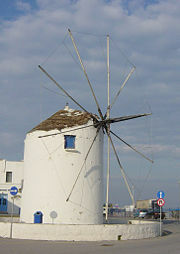 A fixed windmill typical of the Cyclades Islands. Fixed windmills, oriented to the prevailing wind were, for example, extensively used in the Cyclades islands of Greece. The economies of power and transport allowed the use of these 'offshore' mills for grinding grain transported from the mainland and flour returned. A one-tenth share of the flour was paid to the miller in return for his service. This type would mount triangular sails when in operation. In North Western Europe, the horizontal-shaft or vertical windmill (so called due to the dimension of the movement of its blades) dates from the last quarter of the twelfth century in the triangle of northern France, eastern England, and Flanders. These earliest mills were used to grind cereals. The evidence at present is that the earliest type was the post mill, so named because of the large upright post on which the mill's main structure (the "body" or "buck") is balanced. By mounting the body this way, the mill is able to rotate to face the (variable) wind direction; an essential requirement for windmills to operate economically in North-Western Europe, where wind directions are various. By the end of the thirteenth century, the masonry tower mill, on which only the timber cap rotated rather than the whole body of the mill, had been introduced. Given that only the cap of the tower mill needed to be turned, the main structure could be made much taller, allowing the blades to be made longer, which enabled them to provide useful work even in low winds. Windmills were often built atop castle towers or city walls, and were a unique part of a number of fortifications in New France, such as at Fort Senneville. The familiar lattice style of windmill blades allowed the miller to attach cloth sails to the blades (while applying a brake). Trimming the sails allowed the windmill to turn at near the optimal speed in a large range of wind velocities. 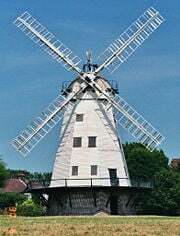 Upminster (Essex, UK) Windmill in June 2006; a smock mill - before it lost one of its sails in an early 2007 storm. The fantail, a small windmill mounted at right angles to the main sails which automatically turns the heavy cap and main sails into the wind, was invented in England in 1745. The smock mill is a later variation of the tower mill, constructed of timber and originally developed in the sixteenth century for land drainage. With some subsequent development mills became versatile in windy regions for all kind of industry, most notably grain grinding mills, sawmills (late sixteenth century), threshing, and, by applying scoop wheels, Archimedes' screws, and piston pumps, pumping water either for land drainage or for water supply. In 1807, William Cubitt invented a new type of sail, known there on as patent sails, that could be regulated whilst moving and became the basis of self-regulating sails, which avoided the constant supervision that had been required up till then. With the Industrial Revolution, the importance of windmills as primary industrial energy source was replaced by steam and internal combustion engines. Polder mills were replaced by steam, or diesel engines. These changes, however, had a lesser effect on the Mills of the Norfolk Broads in the United Kingdom, as the mills are so isolated (on extensive uninhabitable marshland). Therefore, some of these mills continued to be used as drainage pumps till as late as 1959. More recently, windmills have been preserved for their historic value, in some cases as static exhibits when the antique machinery is too fragile to put in motion, and in other cases as fully working mills. Farm windmill, Sheridan County, Kansas, USA, 1939. Windmills feature uniquely in the history of New France, particularly in Canada, where they were used as strong points in fortifications. Prior to the 1690 Battle of Québec, the strong point of the city's landward defenses was a windmill called Mont-Carmel, where a three-gun battery was in place. At Fort Senneville, a large stone windmill was built on a hill by late 1686, doubling as a watch tower. This windmill was like no other in New France, with thick walls, square loopholes for muskets, with machicolation at the top for pouring lethally hot liquids and rocks onto attackers. This helped make it the "most substantial castle-like fort" near Montréal. In the United States, the development of the water-pumping windmill was the major factor in allowing the farming and ranching of vast areas of North America, which were otherwise devoid of readily accessible water. They contributed to the expansion of rail transport systems by pumping water from wells to supply the needs of the steam locomotives of those early times. Two builders were the Eclipse Model of Windmill (later bought by Fairbanks-Morse) and Aeromotor. They are still used today for the same purpose in some areas of the world where a connection to electric power lines is not a realistic option. Windmills and related equipment are still manufactured and installed today on farms and ranches, usually in remote parts of the western United States where electric power is not readily available. The arrival of electricity in rural areas, brought by the Rural Electrification Administration (REA) in the 1930s through 1950s, contributed to the decline in the use of windmills in the United States. Today, the increases in energy prices and the expense of replacing electric pumps has led to an increase in the repair, restoration, and installation of new windmills. Most modern generations of windmills are more properly called wind turbines, or wind generators, and are primarily used to generate electric power. Modern windmills are designed to convert the energy of the wind into electricity. The largest wind turbines can generate up to 6MW of power. (For comparison, a modern fossil fuel power plant generates between 500 and 1,300MW). With increasing concerns about the environment and limits to fossil fuel availability, wind power has regained interest as a renewable energy source. 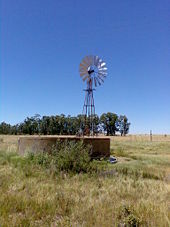 Windpumps similar to this one near Winburg are to be found on remote farms all over South Africa. Windpumps of the type pictured are used extensively in Southern Africa and Australia and on farms and ranches in the central plains of the United States. In South Africa and Namibia thousands of windpumps are still operating. These are mostly used to provide water for human use as well as drinking water for large sheep stocks. Kenya has also benefited from the Africa development of windpump technologies. At the end of the 1970s, the UK NGO Intermediate Technology Development Group provided engineering support to the Kenyan company Bobs Harries Engineering Ltd for the development of the Kijito windpumps. Nowadays Bobs Harries Engineering Ltd is still manufacturing the Kijito windpumps and more than 300 Kijito windpumps are operating in the whole of East Africa. Brograve Mill, UK. An example of the derelict state of many Broadland Windpumps. The Netherlands is well known for its windmills. Most of these iconic structures situated along the edge of polders are actually windpumps, designed to drain the land. These are particularly important as much of the country lies below sea level. Many windpumps were built in The Broads of East Anglia in the United Kingdom for the draining of land. They have since been mostly replaced by electric power. Many of these windpumps still remain, mainly in a derelict state, but some have been restored. 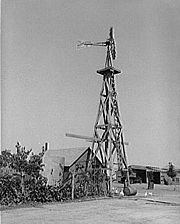 On U.S. farms, particularly in the Midwest, windpumps of the type pictured were used to pump water from farm wells for cattle. Today this is done primarily by electric pumps, and only a few windpumps survive as unused relics of an environmentally sustainable technology. 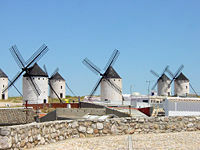 Spanish windmills at La Mancha. Miguel de Cervantes' book Don Quixote de La Mancha, which helped cement the modern Spanish language and is regarded as one of the greatest works of fiction ever published, features an iconic scene in which Don Quixote attacks windmills that he believes to be ferocious giants. This gave international fame to La Mancha and its windmills, and is the origin of the phrase "tilting at windmills," to describe an act of futility. The windmill also plays an important role in Animal Farm, a book by George Orwell. In the book, an allegory of the Russian Revolution and the subsequent early Soviet Union, the effort invested construction of a windmill is provided by the animals in the hope of reduced manual labor and higher living standards. Original seventeenth century wooden windmill, Gettlinge, Oland, Sweden. A Midwestern wind pump in Arlington, Indiana. The mechanism connecting the wheel to the pump is missing. A modern windmill in Sweden. More than 20 windmills on display in the museum at Loeriesfontein, in the Northern Cape, South Africa. An old example of an "SA Climax" at Loeriesfontein; still made and thousands in use in South Africa. Don Quixote and Sancho Panza after an unsuccessful attack on a windmill by Gustave Doré. ↑ A.G. Drachmann, 1961, "Heron's Windmill," Centaurus. 7:145-151. ↑ 2.0 2.1 Dietrich Lohrmann, 1995, "Von der östlichen zur westlichen Windmühle," Archiv für Kulturgeschichte. 77:1:1-30. ↑ Ahmad Y. Hassan, and Donald Hill, 1986, Islamic Technology: An illustrated history. Cambridge, UK: Cambridge University Press. ISBN 0521422396. ↑ 4.0 4.1 4.2 4.3 4.4 Rene Chartrand, 2005, French Fortresses in North America 1535–1763: Québec, Montréal, Louisbourg and New Orleans, Oxford, UK: Osprey Publishing. ISBN 184176714X. ↑ Quirky old-style contraptions make water from wind on the mesas of West Texas, KENS 5 and the San Antonio Express-News. Retrieved October 11, 2007. ↑ Don Quixote gets authors' votes, BBC. Retrieved October 11, 2007. Chartrand, Rene. 2005. French Fortresses in North America 1535–1763: Québec, Montréal, Louisbourg and New Orleans. Oxford, UK: Osprey Publishing. ISBN 184176714X. Drachmann, A.G. 1961. "Heron's Windmill" Centaurus. 7. Hassan, Ahmad Y., and Donald Routledge Hill. 1986. Islamic Technology: An illustrated history. Cambridge, UK: Cambridge University Press. ISBN 0521422396. Lohrmann, Dietrich. 1995. "Von der östlichen zur westlichen Windmühle" Archiv für Kulturgeschichte. 77:1. Needham, Joseph. 1991. Science and Civilization in China: Volume 4, Physics and Physical Technology, Part 2, Mechanical Engineering. Cambridge, UK: Cambridge University Press. ISBN 0521058031. Vowles, Hugh Pembroke. 1931. "An Enquiry into Origins of the Windmill" Journal of the Newcomen Society. 11. The International Molinological Society (TIMS). All About The American Water Pumping Windmill. Mill database with over 15000 mills from all over Europe. Poldaw Windpumps – intended principally for applications in developing countries. History of the Traditional American Farm Windmill. American Wind Power Center – An American water pumping windmill museum in Lubbock, Texas USA. Shattuck Windmill Museum – Thirty-nine water pumping windmills used on the plains; located in Shattuck, Oklahoma. This page was last modified on 4 August 2013, at 19:21.